Very happy to say that I can be seen at the 0:18 mark of this clever AT&T Business spot directed by Adam Berg of Smuggler for BBDO Worldwide. Thanks to Jodi Sonnenburg for bringing me in for the audition, the ever-wonderful Sid Levin for submitting me, and fellow board members Sarah Chaney, Ravi Naidu, and Giannina Toaxen for a fun day of work together. This entry was posted in Acting on June 30, 2018 by David. This entry was posted in Theater on April 23, 2018 by David. 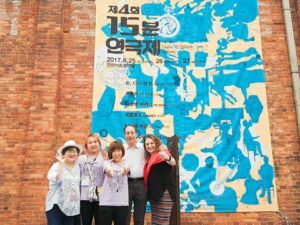 Robyn and I are now back in L.A., returned from our beautiful and very special honeymoon in Korea, which also included the chance to see seven of my one-act plays being produced in Korean translations in a production at the Incheon Arts Platform. Besides the time with our new theater friends in Incheon, we criss-crossed the country by high-speed rail and express bus to see the spectacular natural sites in Seoraksan National Park, saw ancient burial mounds, temples, and shrines in Gyeongju, and visited the mountain-top Seokguram Grotto where monks were leading a service in front of a centuries-old statue of the Buddha. We also had a too-brief overnight stay in Seoul, where we saw the Secret Garden at Changdeokgung Palace, visited artisanal workshops in the Bukchon Hanok Village, strolled along the stream-side Cheong-gye-cheon promenade, and, much to Robyn’s enjoyment and my mild chagrin, visited a cat café with actual cats on Insa-dong Street. We can’t say enough to thank extraordinarily tireless and resourceful theater producer Gunyoung Kuon, who extended the invitation for us to come and was so gracious and friendly to us throughout. Special thanks also to our patient translators Jina and Edi, and to all the directors, actors, and stage crew who came together over three days at the Incheon Arts Platform to create some truly magical theater – as a writer, these are the kind of imaginative, creative, and skilled performances you always want your work to receive, in any language. This entry was posted in Theater on September 3, 2017 by David. The Cat and the Fiddle’s new location on Highland Avenue. The Cat and the Fiddle was the first bar I used to frequent with friends on a regular basis after moving back to Los Angeles from New York City in the mid-1980’s. In those days before microbreweries and brewpubs, it was the place where I first learned to appreciate ales and stouts and British pub fare. It was a gastropub before they were called that. It quickly became a favorite hang-out, and a couple years later the place where my grad school friends and I would most often go for food and drinks. While students in the Directing, Producing, and Cinematography disciplines were on most Friday nights beginning grueling week-long shoots that would determine their future at the school, my fellow Writing students and I would roll out of James Hosney’s film studies course and head to The Cat and the Fiddle for beer and food and bad jokes. Some of my AFI friends probably still remember me as the guy who always ordered Bass and chips. 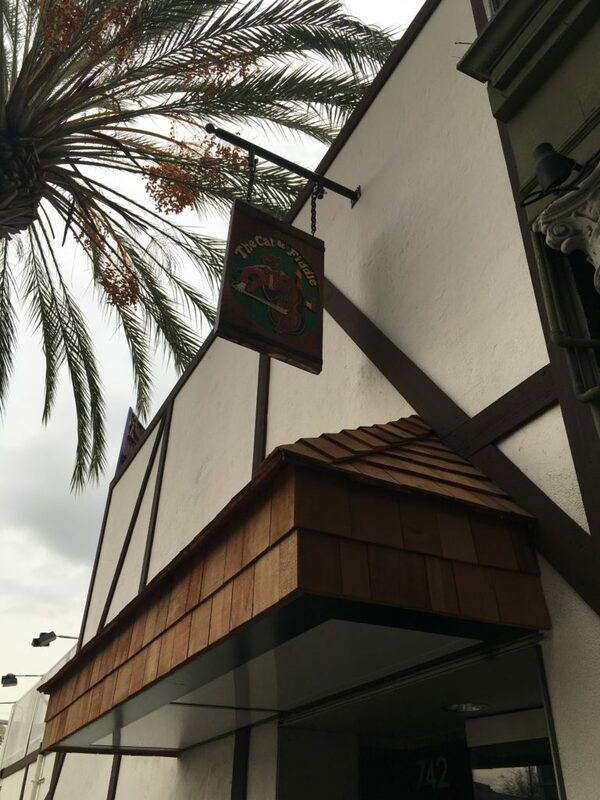 The growth of brewpubs and nightlife over the years meant that The Cat and the Fiddle was no longer one of the only places you could go to in Los Angeles for a good beer in a pleasant location. In my own neighborhood, The Fat Dog offers the kind of casual urban atmosphere that was almost entirely missing from the L.A. of the 80’s and early 90’s. But The Cat and the Fiddle remained a favorite of mine until the closing of its Sunset Blvd location just a couple years ago – ironically, a victim of rising rents as a result of the Hollywood renaissance that in some sense it helped pioneer. Happily, the owners are now bringing back The Cat and the Fiddle with a projected March opening, and even happier for me, its new location is right across the street from where I work. It’s the space I still think of as the old Highland Grounds cafe, though it has been through many other iterations both before and after that. There will be an outer patio, though I can’t imagine it will quite match the charm of the 1920’s Spanish-style courtyard of the Sunset location. And though I no longer consume beer, carbs, and sodium quite so unconcernedly as I used to, I imagine at least every once in a while I will drop in to the new location after work for ale and chips. Happy Hour, anybody? This entry was posted in Los Angeles on March 1, 2017 by David.